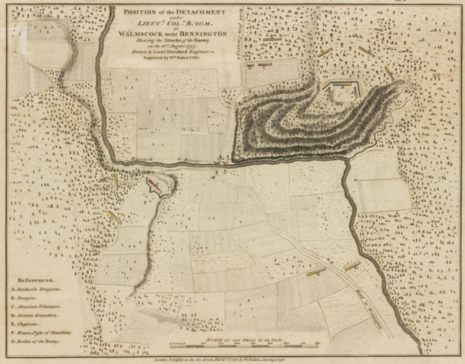 The Battle of Bennington was a battle of the American Revolutionary War that took place on August 16, 1777, in Walloomsac, New York, about 10 miles (16 km) from its namesake Bennington, Vermont. An American force of 2,000 men, primarily composed of New Hampshire and Massachusetts militiamen, led by General John Stark, and reinforced by men led by Colonel Seth Warner and members of the Green Mountain Boys, decisively defeated a detachment of General John Burgoyne's army led by Lieutenant Colonel Friedrich Baum, and supported by additional men under Lieutenant Colonel Heinrich von Breymann. The battle was an important victory for the American cause, as it reduced Burgoyne's army in size by almost 1,000 men, led his Indian support to largely abandon him, and deprived him of needed supplies, all factors that contributed to Burgoyne's eventual surrender at Saratoga. The victory also galvanized colonial support for the independence movement, and played a role in bringing France into the war on the American side. 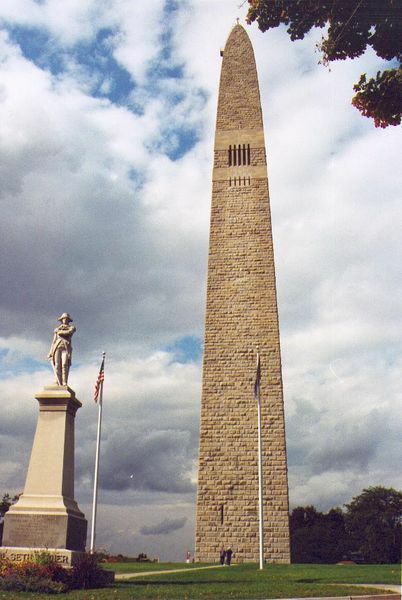 The battle anniversary is celebrated in the state of Vermont as Bennington Battle Day. By early August 1777, John Burgoyne was beginning to feel the pinch of supply shortages and the rigors of traversing the forests of western New York. In particular, the army needed horses for transporting cannon and providing maneuverability for the heavy-booted Brunswick Dragoons. Further, cattle were needed to feed the increasingly hungry troops of all stripes. On August 11, a largely German force was dispatched under Colonel Friedrich Baum. Their target was clear — the rich Connecticut Valley to the east — but the specific orders were confusing. The expedition was to gather horses, saddles and cattle, and also spread the word to all they encountered that Burgoyne would soon be on the road to Boston; the latter was clearly intended as misinformation. This foray deep into the countryside was risky. The soldiers would plunge into deep forest, remove themselves from the safety of the main army and likely expose themselves to a hostile populace. Resistance was encountered from the beginning, but Baum pushed on toward the prosperous community of Bennington. Meanwhile John Stark, an American hero at Bunker Hill and other early encounters, had raised a brigade of New Hampshire militiamen. Still seething from being passed over for promotion by Congress, he refused to submit to the authority of the generals in the Continental Army. Nevertheless, Stark and his men headed toward Bennington under orders from the New Hampshire legislature. On August 16 the opposing forces met outside of Bennington. The outnumbered Germans occupied high ground and put up a spirited fight against overwhelming odds. The battle was not decided until Baum fell mortally wounded; only a handful of his men escaped and the remainder had either been killed or captured. At this moment of seeming triumph, the battle was reignited with the arrival of a German relief column under Lieutenant Colonel Heinrich von Breymann, which threw the contest into doubt. Shortly thereafter, the fortunes turned once more, this time with the appearance of Seth Warner commanding a combined force of regular army and Green Mountain Boys. Breymann’s soldiers were routed and fled into the darkness at day's end. Burgoyne had committed a significant error of judgment by sending forces to Bennington. The Americans were still leery of confronting a major British army in open battle, but they were much more confident about meeting smaller detachments on familiar terrain — exactly the conditions that were present at Bennington. The British sustained more than 800 casualties in the day’s fighting, about 15 percent of Burgoyne’s force. British spirits were further dampened by the slow progress made by Burgoyne’s main army, sometimes as little as one mile a day. Instead of being supplemented by local Loyalists, as they had anticipated, the British were constantly harassed by hostile farmers who willingly burned their crops, destroyed roads and toppled bridges as Burgoyne approached.